Latha ùr, geama ùr a chàirdean. 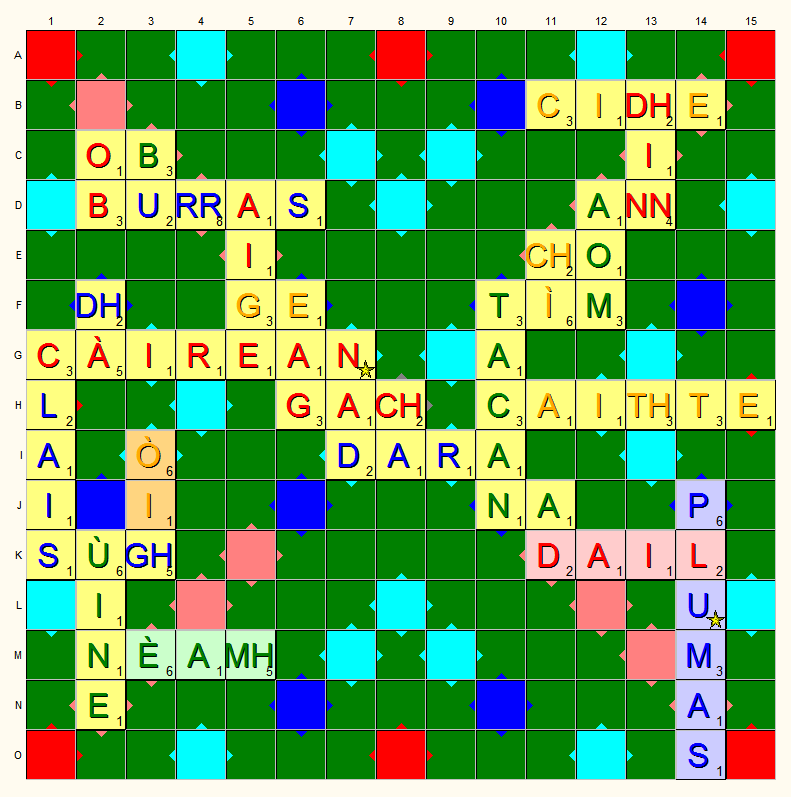 'S e Scrabble an geama an turas seo, tionndadh le sgioba Gearmailteach air a bheil Scrabble3D. Faighibh am faidhle stàlaidh ceart airson an rian obrachaidh agaibh. 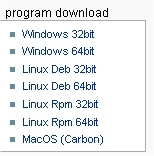 Mar is trice, 32bit ma tha sibh air Windows XP agus 64bit airson Vista/7. Bidh fios aig muinntir Linux air dè dh'fheumas iad! 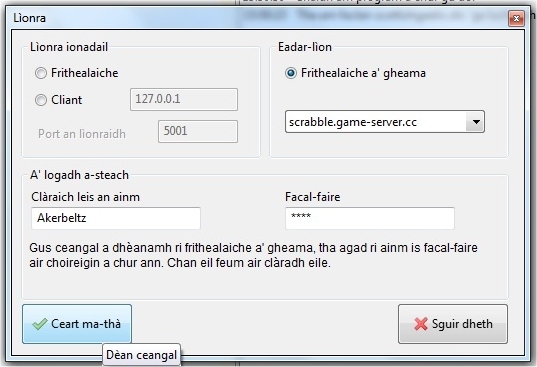 Leigibh leis a stàladh agus bidh e fo Start > Programs > Scrabble 3D an uairsin. Nuair a thòisicheas sibh am prògram a' chiad turas, bidh cothrom agaibh Gàidhlig a thaghadh an dà chuid mar chànan a' phrògraim agus cànan nan geamannan fhèin. Agus sin agaibh e. Tha iomadh gleus eile aig a' gheama seo ach 's urrainn dhuibh fhèin am fiosrachadh a-mach. Aon rud eile mus innis mi dhuibh cà 'm faigh sibh e. Ged a tha aon fhaclair sa gheama, tha dà roinn san fhaclair, faclan às an Fhaclair Bheag agus faclan à Dwelly. Gheibh sibh faclan nas inntinniche ma cheadaicheas sibh an dà rud ach ma tha sibh airson cuairt nas fhasa a chluich, bheiribh air falbh a' chromag às a' bhogsa agus cha nochd uiread a dh'fhaclan inntinneach. 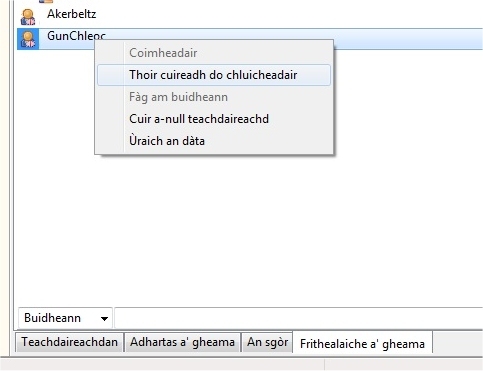 Gheibh sibh e air Uici a' gheama is Sourceforge agus tha fòram aig a' gheama. Ach gheibh sibh taic an-seo cuideachd. Chì mi ann sibh, geamairean abù! Nach eil sin a' coimhead math! Tha mi a' siubhal cus na seachdainean seo agus gun eadar-lìon gu trice, ach tha mi a' dèanamh fiughair ris as dèidh sin. Bidh e math ur faicinn ann! Cha ghabh seo atharrachadh ma tha an geama a' dol, feumaidh sibh a dhùnadh an toiseach. Agus na cluichibh leis na roghainnean eile, 's iomadh rud a ghabhas briseadh ann! Math fhéin. 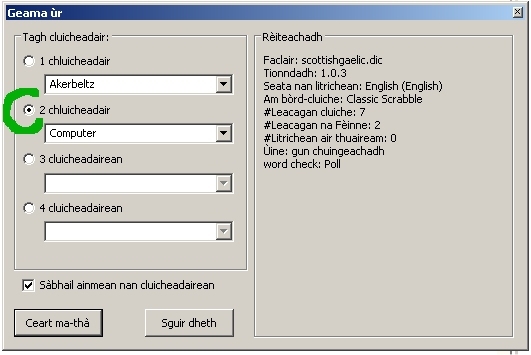 Agus is fìor toigh leam am beachd litrichean aonair a dhèanamh de ‘dh’, ‘sh’, ‘rr’, 7c. 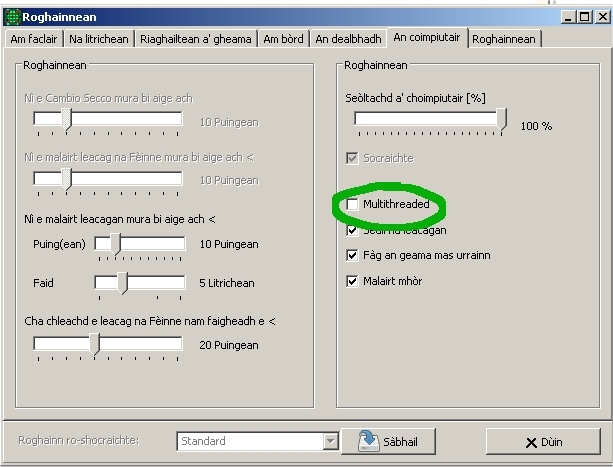 Mur an do mhothaich sibh dha roimhe, tha tionndadh ann airson MacOSX a-nis! Well, bha build ann airson MacOSX roimhe ach cha robh a' Ghàidhlig ann ach tha nis. 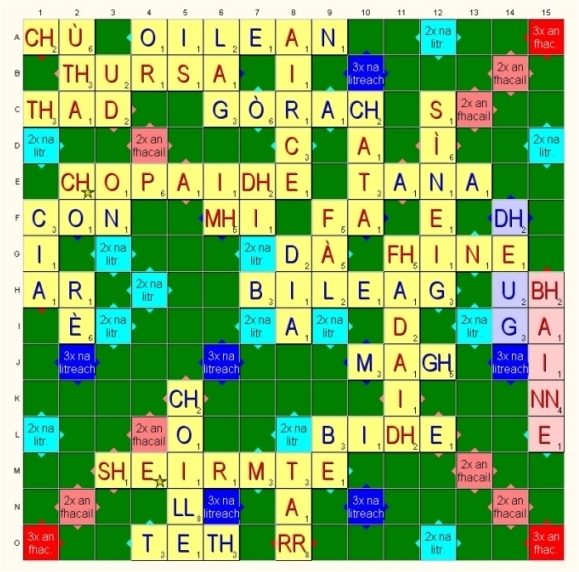 Gèam-a-thon Scrabble Gàidhlig a-nochd eadar 7-9f GMT - bithibh ann no bithibh fann! 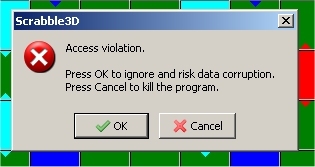 You click on the blue-grey globe in the game (on the menu bar), pick any name and password, then hit OK (remember the name and password though). 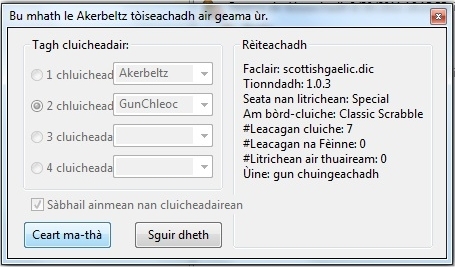 You then need to wait for someone who speaks Gaelic - you can tell by hovering your mouse over the name to see if they're using the game in Gaelic (it'll say menu/clàr-taice: and show the Scottish flag). When you find someone, left click on that player once, then right click and send invite. That's it. Gaelic players are kinda rare, so your best bet is to arrange to meet someone at a given time. 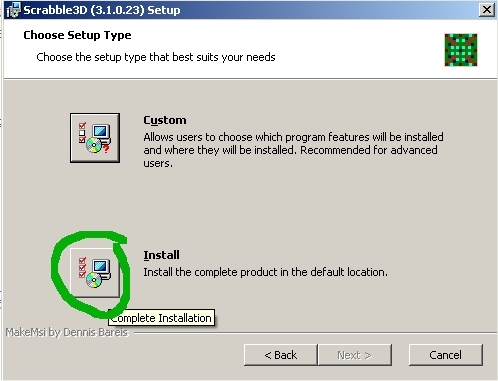 The screenshots above show how to do that too, from Screenshot #7 onwards. An dòchas gun còrd e ribh!